Have you ever counted the number of plastic bottles in your bathroom? We are a recycling family but since our showers are on the 2nd floor I often find plastic bottles in the trash, too lazy to walk them down to the recycle bin. While 7 out of 10 Americans say they always or almost always recycle, only 1 in 5 Americans consistently recycle in the bathroom. Many consumers don’t even realize that most products commonly used in the bathroom, such as shampoo, lotion and cleanser bottles, can be recycled. 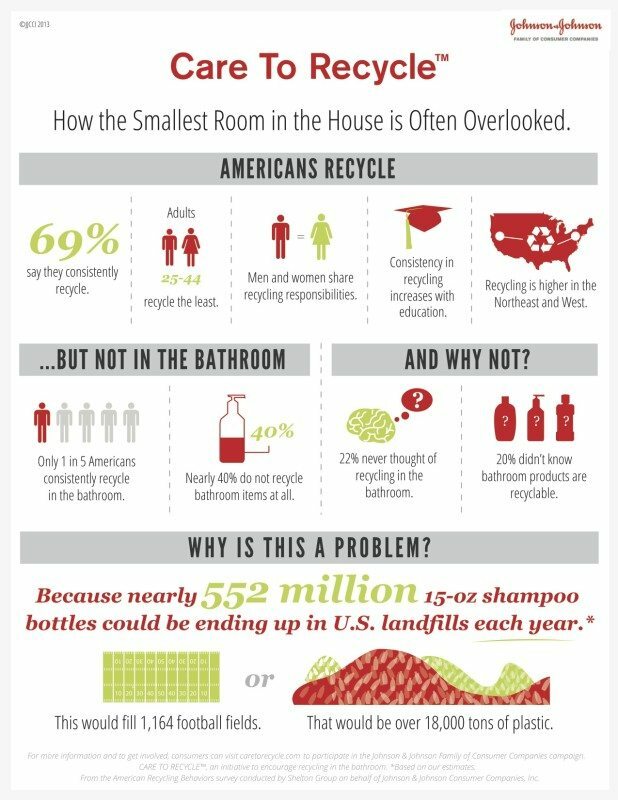 I don’t ever really look at the bottom of the plastic bottles in my bathroom to see if they are recyclable and apparently we are not the only family . Each year, Americans throw away enough 15-oz. shampoo bottles to fill 1,164 football fields—that’s 18,000 tons of plastic ending up in landfills. So, this can have a major impact on the environment. That is an amazing statistic don’t you think? I am so excited to share with you the recycle campaign Johnson & Johnson is launching CARE TO RECYCLE™, that encourages people to recycle more items from the bathroom. Visit the The Care To Recycle™ Tumblr page, for helpful information and tips on what can and can’t be recycled help spread the word. 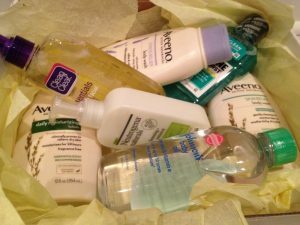 By helping spread the word about THE CARE TO RECYCLE campaign on lucky Close to Home reader has a chance to win an assortment of recyclable Johnson & Johnson products (including Aveeno, Neutrogena, Clean & Clear, & others). Enter the rafflecopter below. I have nothing to upcycle in my bathroom.. I do! I use grocery bags in the garbage can, I also use the little plastic frosting containers to store hair ties, and hair pins. We upcycle boxes and containers and recycle the rest. I have not, but I think I am going to start now! I have not done that but I should! I have recycled non aresol hair spray bottles with just water in them to spritz my granddaughters statically hair and one for mister for my plants, works well, bu tthat is probably the extent of my up cycling bathroom products. I have not as of yet, but I love the ideas and will start doing something. 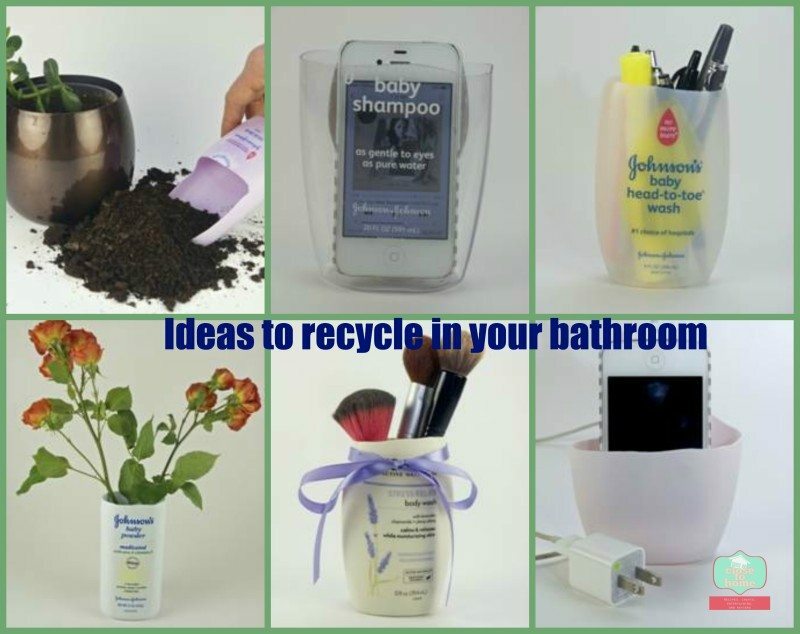 I have not upcycled any items in my bathroom, but I do love these ideas. I use the small jars when they are empty to put my craft supplies in. I have not upcycled any items in my bathroom, but some of the ideas listed above are good ideas. Thanks! I re-use grocery bags for bathroom trash. I have not upcycled items… I never really thought about it. Will have to try some of these! I have recycled things in my bathroom my husband actually takes some of them to use for storing things in his workshop!